The LocalChecker is a plugin for the JavaABC that is responsible for testing local terms of SIBs and visualizes messages about the results in the plugin inspector. There are four grades of messages, which denote the severity of the problem. Info - Clues of this grade have an informative character. Warn - Warnings remark that there might be a problem in the SIB. Generally a parameter or branch deviates from the normal usage. Error - The SIB is used falsely. This can cause an unexpected behaviour of the Graph. There is need for action. 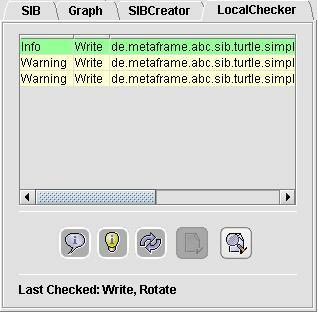 Fatal error - The SIB is in an undefined state. The graph might be impaired by this severe error. There is badly need for action. The LocalChecker Manual is part of the general jABC Manual.